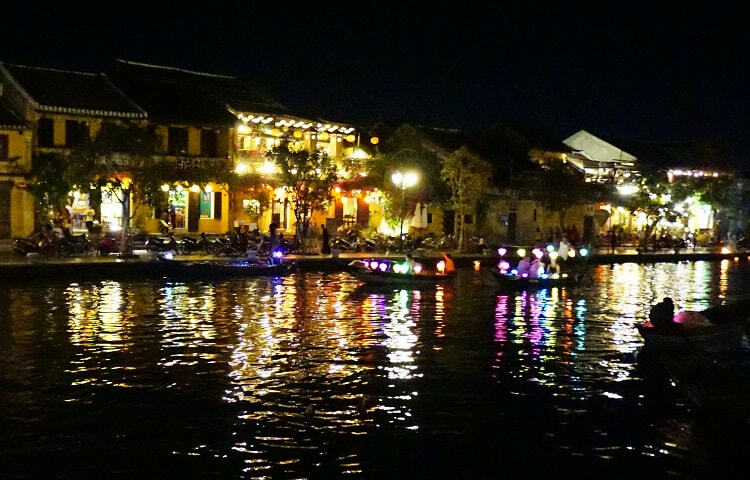 I had mixed feeling about Hoi An. It was a pretty town with lots of amenities and great food, but very much on the touristy side. I felt like it was one of those places that may have had authentic origins, but today is built on tourism. There are some advantages to this. More people spoke English here than any of the other areas we visited and you can find just about anything. If you are looking for custom made products, shopping, night life, massages, and lanterns, this is the place. Our favorite things were the basket boats and the cooking class. We stayed central enough that we were within easy walking distance of most things. If you do need a ride there are plenty of taxis, motorbike taxis, and boats to take you wherever you want. Just make sure you don’t hop in a boat with anyone who says the ride is “free.” The ride out may be free, but unless you want to swim back you will have to pay. Always negotiate ahead of time. The main market covers a few blocks near the water front (GPS: 15.87682,108.33128). The personality of this markets shifts constantly throughout the day. In the morning only the fresh food areas are open and it is bustling with locals out doing their shopping. 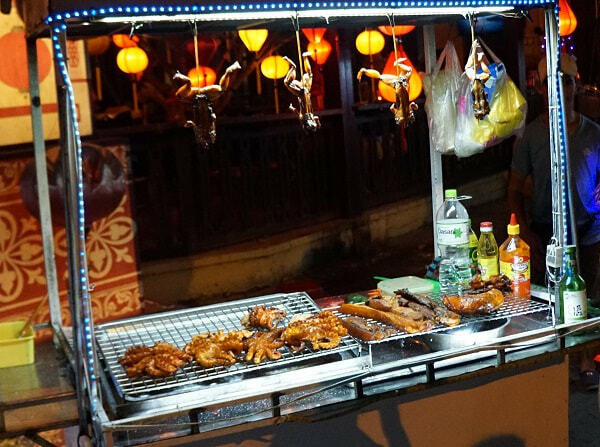 By mid-day it has shifted to more of a flee market with lots of trinkets for tourists, and by night it transforms again into a night market (6-10PM) selling food (much of it on sticks) and snacks. Most of the day you can find lots of fresh fruit and something to eat. We had two meals in the middle of the central building and they were both very good. There are over a dozen vendors that all look nearly the same, with benches set up in front of food counters. They offer English menus with pictures and fixed prices. We picked at random and the cao lầu was excellent. Our other meal here was good too (different day, different vendor). We also purchased a bag of a variety of fruits and a sampling of pastry type things to try from other vendors in this market. The fruit lady was a great sales person and offered us lots of samples of fruits we had never seen before so we knew what we were buying, but didn’t have any posted prices. If you are squeamish, avoid the end of the building closest to the water where they sell meat literally from the snout to the tip of the tail. Night life came in two flavors here. There were the peaceful lantern lit streets/river and a few crazy bars catering to those looking for a lively night out. Every night the town turns on lanterns above the streets and lantern lit boats take tourists out on the water to make wishes and send candles adrift. Many people found this enchanting. For me this was pretty, but a bit cheesy. It seemed to be a battle in which boat could be the most bedazzled and the cardboard lotus flower floating candles just didn’t do it for me. It felt like a show and looked better from a distance. Most of the town seems to go to bed around ten, but there are always a few bars that serve thirsty backpackers late into the night. We got back to our hotel around midnight and found the lobby dark and the front desk attendant sleeping on a mattress in front of the desk. This town has some great food. I talk all about it in my Vietnam Food Post, but if you are in Hoi An or the Da Nang area make sure you try cao lầu, the signature noodle and pork dish of this area. I recommend trying it in the market (see above). I had it in a nice restaurant, where it was just ok, and from a market stall, where it was fantastic (and a third of the price). 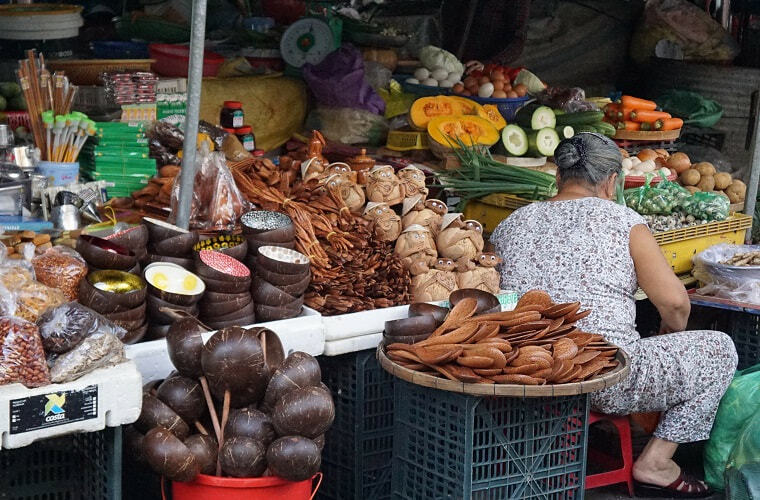 This seems to be one of many places in Vietnam where instead of getting what you pay for, you get rewarded for eating like a local. 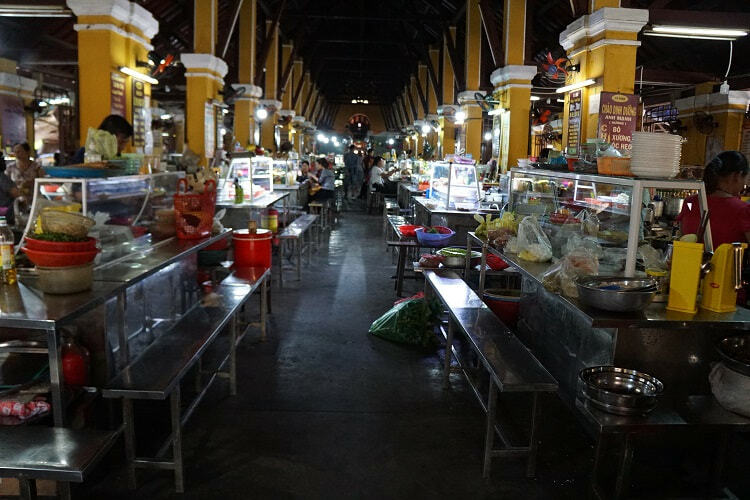 You can find food just about anywhere in this town, but the largest concentrations of food cart vendors seem to congregate at the market (GPS: 15.87682,108.33128) and on Thái Phiên Street (GPS: 15.88157,108.32856). We walked Thái Phiên Street twice and only saw locals eating here, which I took to be a good sign, but sadly we weren’t hungry and didn’t get a chance to try anything. This was interesting to see. Shops and restaurants operate mostly as normal, except by candle light. Almost every shop, even some carts, set up shrines or tables with offerings to their ancestors. They burn incense, set out fruit, flowers, and snacks, and many people burn things in small metal buckets. Part of the traditional belief is that ancestors need to be remembered and provided for in the afterlife. 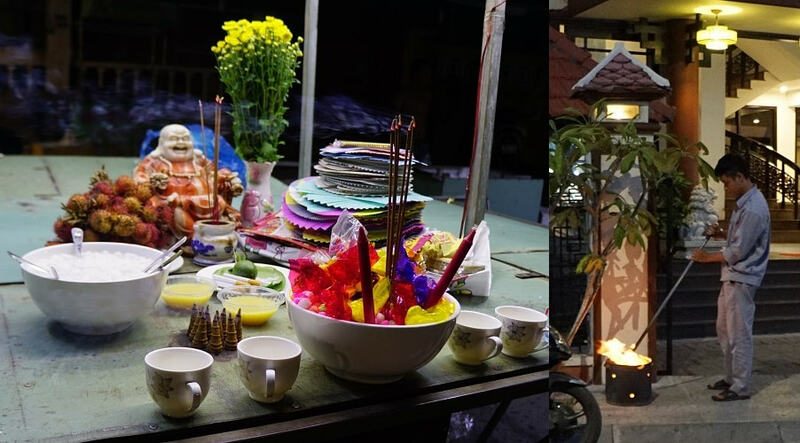 Vietnam may not be a very religious country anymore, but their traditions are very much alive. The book When Heaven and Earth Changed Places explains this practice and more. For a bit of context on the culture I highly recommend When Heaven and Earth Changed Places, by Le Ly Hayslip. This is a memoir that reads like an suspense novel. The author was a farm girl in the rice paddies near Da Nang (not far from Hoi An). She was a child during the French War, a teenager during the American War (Vietnam War), and now lives in America. She skillfully weaves the culture into her novel and talks about her journey from Viet Cong agent to American. Her second book Child of War, Woman of Peace isn’t as suspenseful, but gives a good view into what life was like transitioning to America and also returning to this area of Vietnam in the mid-80s and 90s. The history and legend of these boats is that they came about when Vietnam was a French colony and the French imposed a boat tax. Since these were baskets, not boats, they evaded the tax and became quite popular. Today they are still used by many for fishing and several places also offer rides to tourists. We went on a basket boat ride and crab fishing part of our excursion (around 11:30AM). The mangroves where they do the basket boating excursions seem to get more crowded in the afternoon. Some guides offer to spin the boats, but this is optional. Occasionally boat guides do performances in their boats in between fares, like the one in the clip below. Our ride included crab fishing, so our boat guide offered us a stick with a piece of meat on a string and taught us how to tempt the small crabs that perch on the vegetation with the meat and gingerly pull them up. We were unsuccessful at getting any all the way into the boat, but it was fun. 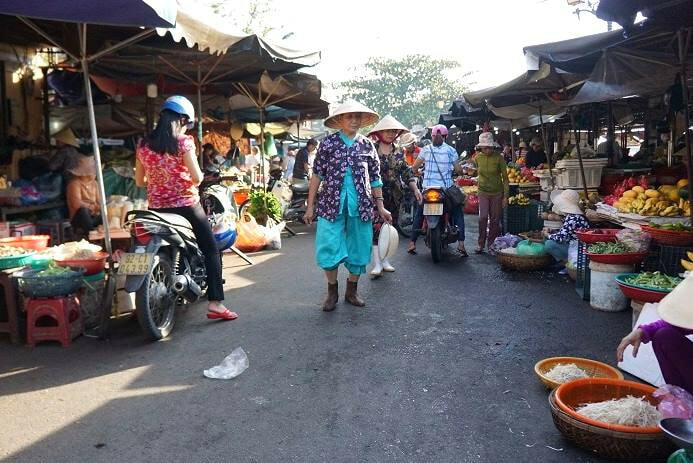 We had a package tour with Bay Mau Eco Cooking Tours that included a boat ride from Hoi An to the basket boats, a ride in the basket boats with crab fishing, the cooking class, and a van ride back to our hotel. This and our menu is a bit different than the standard package advertized on the Bay Mau’s website, so it may have been customized for our group. I have not been asked to promote this company and I am sure there are many other excellent ones out there, but we thoroughly enjoyed it, especially out cooking instructor Nhi. Our cooking class was at Bay Mau Eco Cooking and it included learning how to turn unhulled rice into rice milk, used it to make rice noodles the traditional way, then made a fresh spring roll, a fried crepe, and a noodle dish. Our instructor, Nhi, was entertaining, very funny, and a great teacher. We all loved her and I would request her if you go. The food was tasty, and the best part for me was that it was customizable. I love fresh spring rolls and wanted to try the crepes, but all the ones we saw were made with shrimp and I am allergic. Here you could make them with or without whatever you wanted, so I finally got to safely try both! For the cooking portion the format is the instructor does a demonstration of the dish, lets you try the sauce so you know what it is supposed to taste like, then you go to a station and replicate it. It was a little tricky for some of the more complicated ones because you have to remember the steps, but the instructor and several assistants float around to make sure you are doing it right. At the end they give you pamphlet with instructions for the dishes you made so you can try them at home. 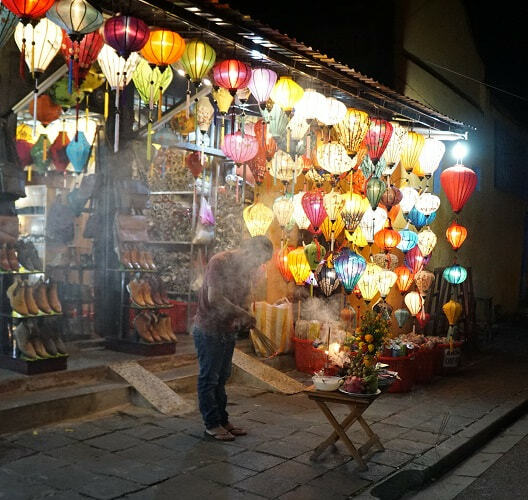 I can’t talk about Hoi An, nicknamed The Tailor Town, without talking about tailors. This town seems to have multiple tailors on every street. People come here to get suits made and entire wedding parties fitted. There are stories about the amazing one of a kind dresses and the ones that fell apart the first time they were worn. We decided we had to try this, but wanted to be practical so we each had a shirt made. We went to Mr. Xe, based on our guide’s recommendation and Google reviews, and each had a dress shirt made for $25 per shirt. The process was we went in and picked a design off of an iPad, got measured, picked a material, and put down a deposit. We came back about 24 hours later for a fitting. If we needed more adjustments we came back a few hours later for a second fitting and settled the bill, then they delivered the clothes pressed in bags to our hotel. Some of the ladies spoke better English than others but we managed pretty well. I was very happy with my shirt and have washed it at least 5 times no without issue. My husband’s shirt fit well until he put an undershirt on under it, which to be fair he didn’t have when he was fitted. Overall it was a positive experience and the quality seems fine. There are also many shops that make custom leather shoes, so if you have a hard time getting ones that fit properly this might be worth considering.